Now we've got it, a completely vegetarian based enzyme product. 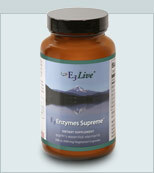 E3 Enzymes Supreme is a cleansing blend of plant-based enzymes and other plant-derived digestive aids. Compared to animal based enzymes, it is more effective and viable for longer periods of time in the body. E3 Enzymes Supreme™ 3-in-1 formula consists of premium, full-spectrum, digestive enzymes with added nutritional co-factors optimized to work in wide pH variations throughout the entire digestive tract. If you eat cooked food, YOU NEED ENZYMES! When you eat cooked or processed foods, your body's enzymes are used to digest the food, diverting them from the important work of protecting and repairing. Enzymes are the 'spark of life'. Without enzymes, our bodies do not properly break down food; therefore we do not absorb vitamins, minerals and amino acids which are the basis of health. Enzymes activate vitamins, minerals and hormones within your body and unlock the energy in food to make it possible for your body to function properly. Our immune system, bloodstream, liver, kidneys, spleen and pancreas especially depend upon enzymes for proper digestive function. Without proper enzymes, our white blood cells try to perform the purpose of the enzymes, usually leaving one feeling tired after eating, and compromising the immune system. Enzymes are responsible for every biochemical reaction that occurs in living matter. All life depends on enzymes. Increase blood circulation to the skin, providing nutrients and carrying away waste products that can make skin look dull and wrinkled. Safely and naturally improves digestion by breaking down fats, carbohydrates and proteins. Help eliminate gas, belching and bloating and assist with regular elimination. Cleans the blood, delivers hormones and triglyceride levels. Helps maintain normal cholesterol and triglyceride levels. Suggested Use: Sprinkle on food or mix with microwater. For digestion, use 1/4 tsp. or more 15 minutes before each meal. When used for body cleansing, use 1 tsp. 3 times per day on an empty stomach either 1 hour before or 2 hours after a meal. Store in a cool dry place, no refrigeration necessary. Important: Drink plenty of microwater throughout the day. If you have ulcers, are pregnant or nursing, consult your healthcare practitioner prior to use. Do not use if safety seal is broken. Important: Drink plenty of alkaline water throughout the day. If you have ulcers, are pregnant or nursing, consult your healthcare practitioner prior to use. Do not use if safety seal is broken. Systemic Enzymes By William Wong N.D., Ph.D.